I was born in Etobicoke in 1975, but I grew up in Kincardine, Ontario. I was interested in drawing and creating art since I was very young. All through public school, and into high school, I drew whenever I could. I was always “the kid in school who could draw”. I quickly learned it was a good social mechanism that helped me fit in and make friends, but more importantly it was an activity where my imagination could run wild, and I tried hard to bring my drawing skills to a level where they could express the ideas in my head. 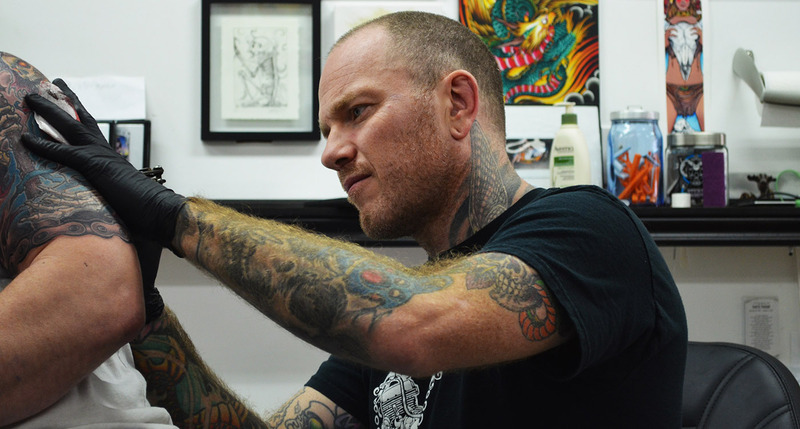 I got tattooed at the age of 14, by my friend Jarkko, who now works alongside me. It was the beginning to a path that has been the focus of the rest of my life. By then, I was already pretty certain I wanted to find a way to make a living creatively, I just wasn’t sure how. I did a year of schooling at The Ontario College of Art, but in between first and second year, amidst some personal uncertainty about whether I wanted to continue my program or not, I was fortunate to be offered an apprenticeship at a shop I was getting tattooed at, and took the opportunity wholeheartedly. I worked in Toronto from 1994-’98, first for Urban Primitive, the shop I started with, and then with Passage tattoo, a newly formed shop at the time. Some time in the spring of 1998 I moved briefly to NYC for about 8 months. Despite having lived in Toronto for 5 years at this point and feeling pretty comfortable in an urban setting, in retrospect I was completely unprepared for New York. After struggling to find my groove there for several months, I joined the crew of the shop on a trip to Berlin to attend the annual convention being held there, and returned to my hometown of Kincardine just before Christmas. I planned to return overseas to Sweden. I had the offer of work with a friend of mine who I had met during a convention trip some years before, and reconnected with in Berlin. I wanted to stay for Christmas with my family, and then maybe for the summer, thinking it might be nice to spend some time in Kincardine during the good weather. Plus, I needed to work, to put aside a small travel fund to help get me started on my way. On Valentine’s Day of 1999 I established Sugar Shack Tattoo in the unused office space in the back of Kevin Bradley’s barbershop, Snip ’n’ Clip. 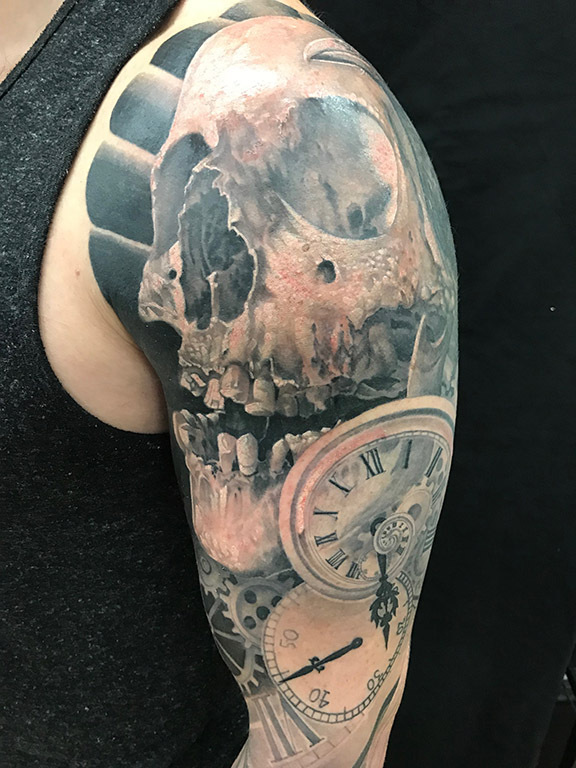 Word quickly spread, and by the end of that summer, I had a small but busy private tattoo studio running, and I was booked about a month ahead. Curious to see whether I could keep the momentum growing, I opted not to leave at the end of that summer, but instead kept Kincardine as my home base, and began travelling two or three times a year on “educational” trips to Europe. I would go for a few weeks at a time, combining guest spots and maybe a convention or two on the same trip, and a bit of sightseeing to round it all out. 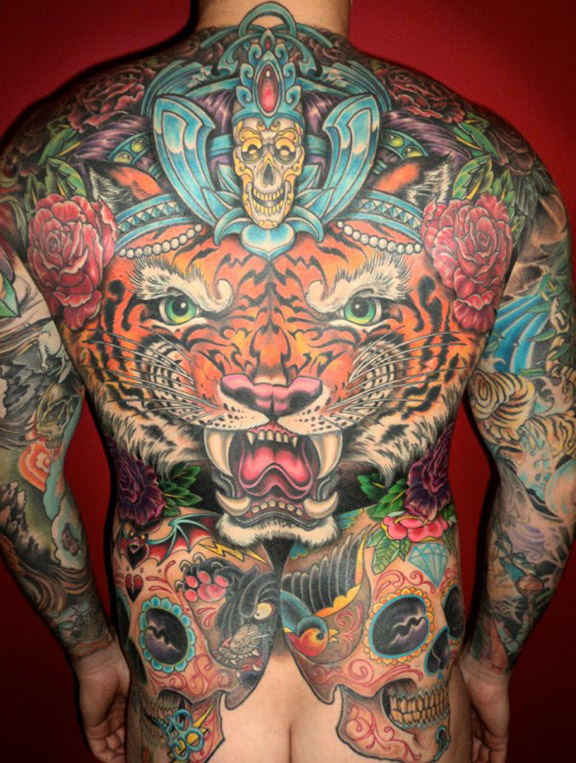 At the shows, I was routinely amazed and inspired by the calibre of tattooing and illustration I was seeing. I was working shoulder to shoulder with some of the best tattooers in the world, trying to absorb and study everything that I could. Then I would return to Kincardine for the next few months, and try to digest and assimilate these new lessons and ideas into my own work, all the while building a community and clientele both at home, and in a few select cities in Europe. By 2002 I had outgrown the confines of the small office in the barbershop, and seized the chance to rent the retail space next door. From there I ran Sugar Shack Tattoo for the next 11 years, with Jarkko working along side me then, having just moved back from Toronto. A rotating cast of other characters came through the shop during that next decade. In 2006 I saw the birth of my first child, Robert, followed in 2008 by my daughter Maggie. I had stopped travelling to conventions almost entirely at this point, to focus on my family. Life with a couple of infants was incredibly busy, as it is for most people, and I split my time between working at a breakneck pace as much as I could, and trying to soak up every bit of time I could get with my kids at home. In 2013 I finally realized a goal I had been working towards for some time: to own the building I was running my shop out of. January of that year I became the owner of 786 Queen Street, an iconic building built in 1881, in the heart of the downtown core, and it is the location Sugar Shack still currently resides in. 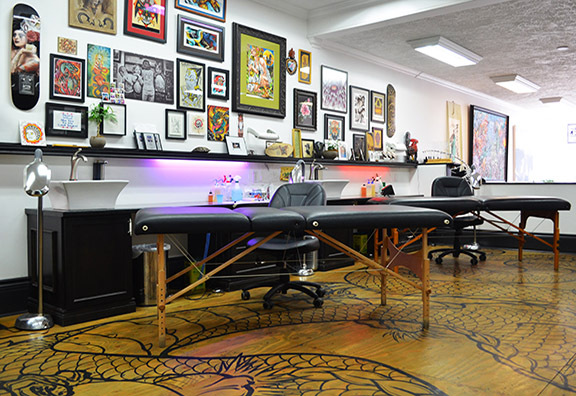 After a colossal amount of effort on the part of family and friends, a couple local tradesmen, and no small financial investment, the building was renovated top to bottom, purpose built as a bespoke tattoo studio, and opened it’s doors on June 1st, 2013. 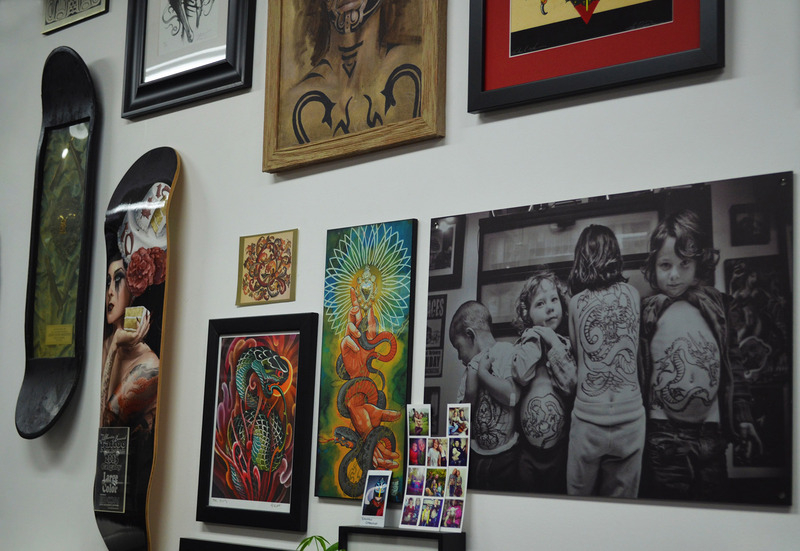 Sugar Shack Tattoo continues to evolve as a business and as a creative space. 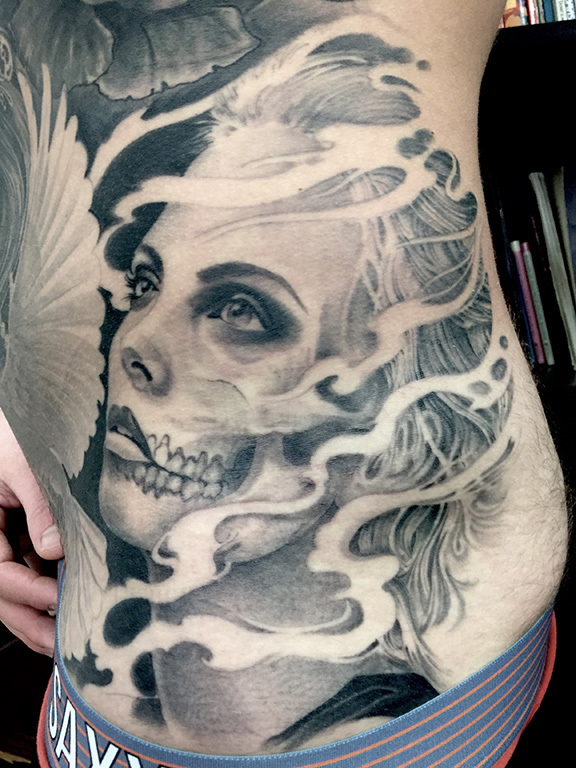 The artists who choose to work under this roof are afforded the opportunity to develop themselves in co-operation with each other and with our clients who allow us to use our artistic vision to craft custom, one of a kind tattoo art, in an environment that is relaxed, comfortable and inspiring. It has been incredibly gratifying to see how the community both near and far has continued to support us over the last two decades, and it has been an honour and privilege to have been given the opportunity to develop and share my craft in the small town I grew up in. I hope Sugar Shack Tattoo continues to evolve as I also further my knowledge and understanding of tattooing. I am amazed and motivated daily by the quality and creativity of tattooing that is being practiced today by the best in the business. 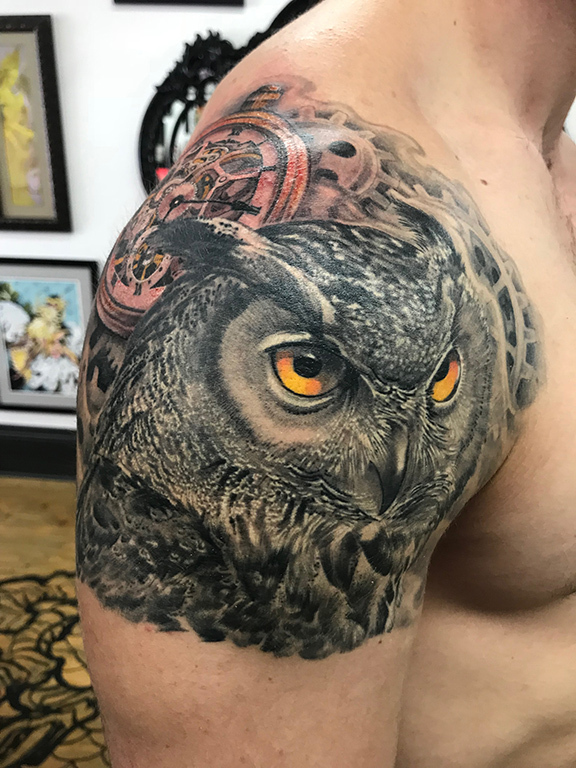 It is both the excellence of my contemporaries, and the trust and faith of my clients that keeps me continuously striving to try to improve my tattooing and create the best experience I can for everyone involved. I will always have a reverence and respect for the industrial-era traditions and history of tattooing as I understand them, but I am also excited by it’s potential to continue to simultaneously evolve with us, while at the same time linking us to our deepest past. It is a fascinating balance between an ancient craft and a contemporary art form as diverse and rich as any other medium. I have the most sincere gratitude to everyone who has supported and encouraged this endeavour along the way. I hope I am blessed with many more years of this adventure ahead of me. I hope you will continue to join us on the trip.